Cool mural in North Park remembers good old days! – Cool San Diego Sights! Cool mural in North Park remembers good old days! 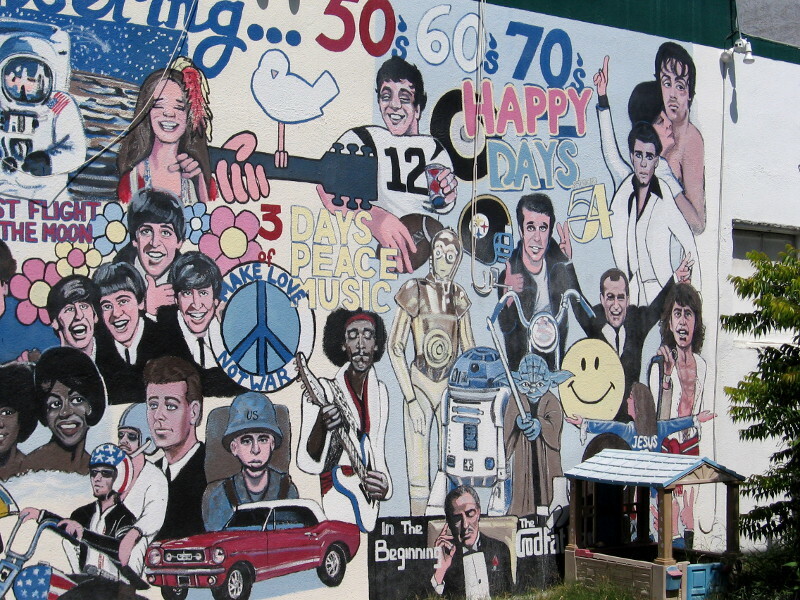 A very cool street mural in North Park depicts icons from three decades: the 50s, 60s and 70s. Check out this super cool street mural in North Park, on the side of a building near the corner of 30th Street and Adams Avenue! It’s titled “Remembering… 50’s 60’s 70’s” and was painted by the artist Kerry A. Moore in 2008. The mural depicts small, iconic scenes from what many might call the good old days! I searched like crazy but could find absolutely nothing about this fun street art on the internet. How many entertainment legends and famous people from those three decades can you spot? Among others, I recognize Elvis, Marilyn Monroe, James Dean, the I Love Lucy show, the Rat Pack, Martin Luther King, Jr., Neil Armstrong, the Beatles, JFK, Easy Rider, Jimi Hendrix, the original Star Wars, The Godfather, Happy Days, John Travolta in Saturday Night Fever, and, of course, Rocky Balboa. I was a kid in the 70’s and remember many good times. Movies I remember fondly include Star Wars, Rocky and Superman. But most of my best old memories are probably from the 80’s, experiencing life and this great big world as a young adult. Wow, the years have gone by quickly. I have a dream. Make love, not war. Happy Days. Revolutionary music, cool cars, sports heroes, and a space opera that changed entertainment forever. Bits of history and popular culture from America’s past. Now that is one jam-packed mural! Thanks! It’s a lot of fun discovering new street art during my walks! No kidding! How creative. That’s a neat discovery, Richard. 🙂 Blessings to your weekend. I do remember – so many memories!! Previous Previous post: Amazing animal bronzes at San Diego Museum of Art! Next Next post: A short story about light, life and reflection.